What spiritual truths would you like to pass on to your favorite sports team? What needs do they have that only God can fill? It's easy to view professional athletes as guys (and girls) who "have it all". Where would you begin? Would you sit down with Shaq or a giant football player and just tell him he's a sinner? In this short but interesting interview the chaplain to the 2013 Superbowl winning Baltimore Ravens describes how pro athletes have their own sets of fears. Yes, they make more money than most of us, but their career is so short (about 6-7 years) that there's fear they won't earn enough to support their family long-term. Every year teams draft more players, which also means every year someone's career ends. 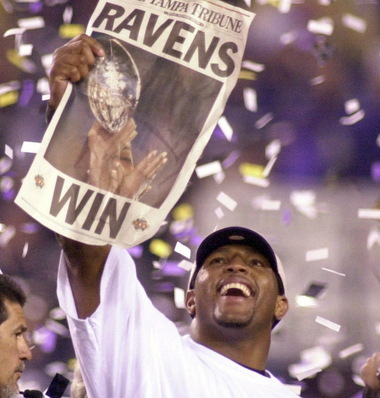 Some careers, like Ray Lewis', end in fairytale glory. The majority end with little fanfare. Players get too old, too expensive, or just replaced by a more talented player at their position. Then there's always the injury risk to strike fear in the heart of any player. There's not only the time lost while recovering, but the fear the body will never recover its previous strength and abilities. This is a short post because I mainly wanted to share that interview. But I do think that Christians are often intimidated by people who appear to "have it all". We'd rather support missionaries to Africa than Europe because the needs are more obvious, and the people seem more receptive. The truth is that the needs in both places are equally severe. Everyone needs Jesus. Sometimes we're intimidated by middle-class suburbia or wealthy suburbia, but the people behind the big gates have relationships that fall apart, family battling depression and addictions, and even financial insecurities. It's just that these people are usually better at hiding their needs. The Christian's mission is to help people see their need for Jesus and that Jesus meets their needs. John 1:4 In him was life, and that life was the light of all people.